Deliciously flavorful, this Indian style leg of lamb is a formal delicacy. The robust flavor of the meaty lamb leg combined with authentic Indian spices makes this dish a mouth watering treat. 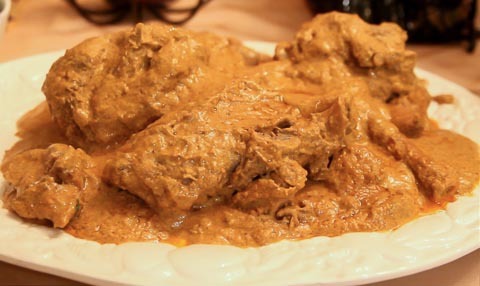 This spicy dish, also known as Raan, is especially tasty served with a rice dish, such as a rice pilaf. 1) Make several deep cuts into the lamb leg. 2) Add the following to a mini-chop blender: whole black peppers, cloves, green cardamoms, nutmeg, black cumin seeds, and mace. Grind. 3) Add the following to a regular blender: red chili pepper, coriander powder, soft pistachios, almonds, coconuts, garlic cloves, ginger, vinegar, lemon juice, fried onions, red onion, salt, and a cup of water. Liquefy. You can additional water if you want the mix to be more liquidy. If your blender isn’t big enough to fit the mixture, then do it in two batches and combine together. 4) Add both blended mixes to a giant bowl. Mix. 5) Then, add the lamb leg to bowl. Mix well so that the lamb leg is covered in spices. 6) Cover and marinate the leg overnight in the fridge. 7) Preheat the oven to 350 degrees. 8) Add some corn oil to a large pot. Then put the marinated lamb leg into the pot. 9) Place the pot with the lamb into the oven. Bake for 1 ½ hours. 10) Lower the heat down to about 300 degrees. Cook for an additional hour. 11) Move lamb leg to the stove in order to evaporate excess water. Cook for about 20-25 minutes on high heat. Lower the heat once the water starts bubbling up. 12) Add ¼ cup of olive oil to the lamb. Mix. 13) Turn off the heat. Add 1 teaspoon of rose water.